in AKC and UKC history to earn Coursing Titles !!! Lure coursing has typically been only a Sighthound sport. 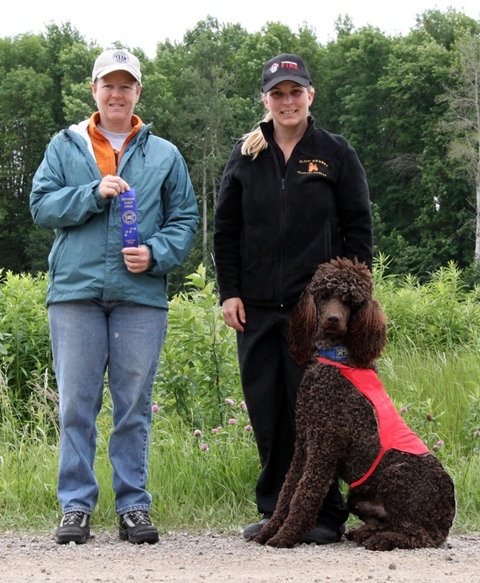 Lure Coursing offers a way to measure a dog's ability, endurance, speed, agility and enthusiasm. thanks to the efforts of UKC Judge Laurie Soutar who wrote the UKC Lure Coursing Rule Book we use today. 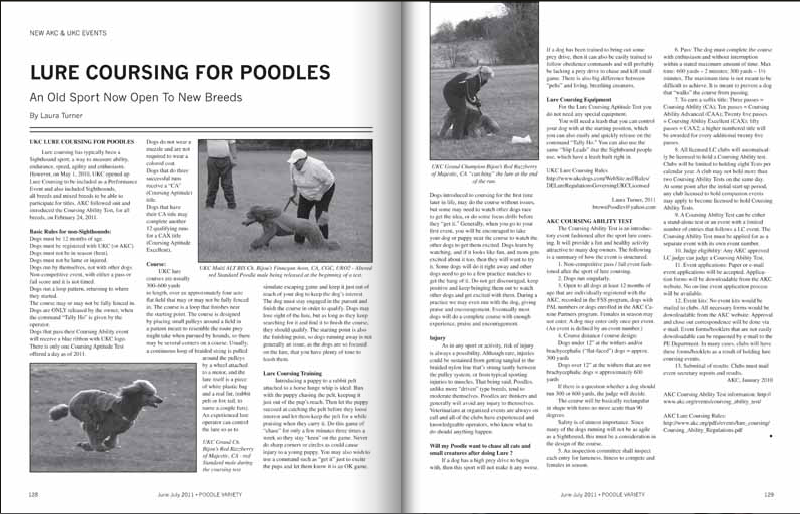 AKC followed suit and introduced the "Coursing Ability Test", for all breeds, on February 24, 2011. Racing events in which dogs of the same breed race against each other. 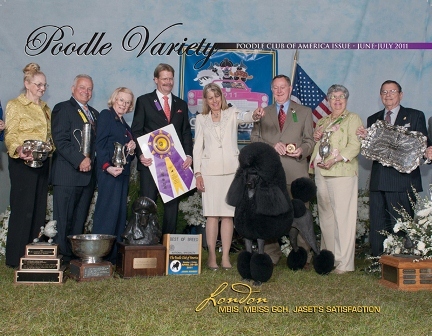 CARO agreed to accept our application if we found a National Breed Club to represent Poodles. may race for titles and placements with competion and official yearly placements with CARO !! 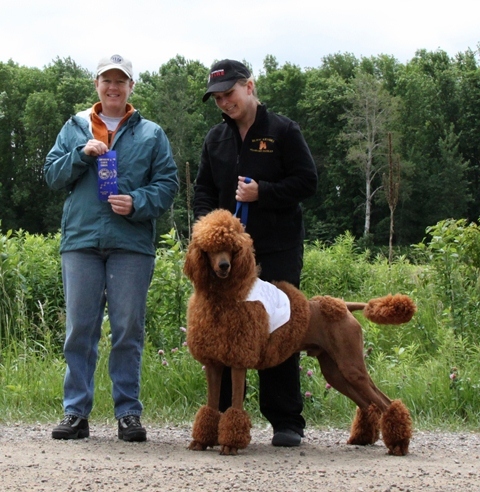 Dogs that do three successful runs receive a UKC "CA" (Coursing Aptitude) Title or AKC "CA" Coursing Ability Title. placed over an approximatly 4 acre flat field that may, or may not be fully fenced in. 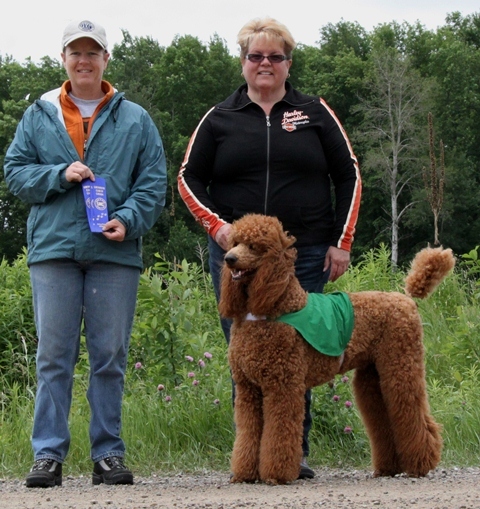 AKC courses vary in length depending on breed. Dogs that are shorter than 12 inches at the withers and /or brachycephalic ("flat-faced") dogs run a 300 Yard Course. and must complete this course in less than 1.5 minutes. All other breeds run a 600 Yard Course and they must complete this course in less than 2 minutes. 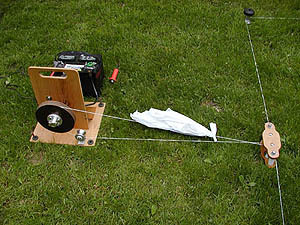 The Lure Coursing Machines are a small 12v high-speed motor powered by a car sized battery. A thin line is then set up around the entire course, wrapped around pulleys that are staked in the ground. 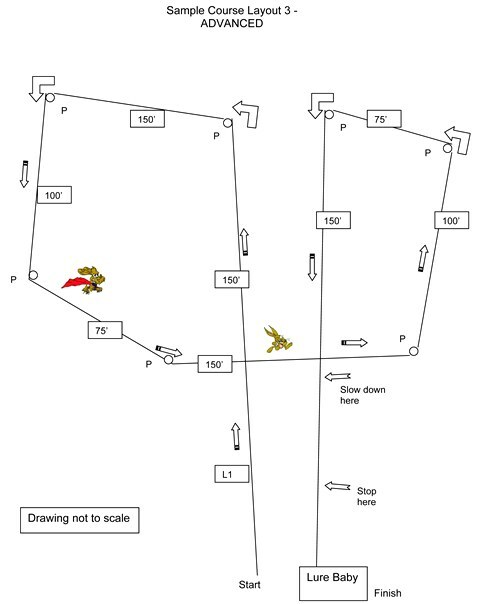 In both UKC and AKC the course is a loop that finishes near the starting point. by a wheel attached to a motor, and the lure itself is a piece of white plastic bag and a real fur, (rabbit pelt or fox tail to name a couple furs). An experienced lure operator can control the lure so as to simulate escaping game and keep it just out of reach of your dog to keep the dog's interest. is not generally an issue, as the dogs are so focused on the lure, that you have plenty of time to leash them. There are different schools of thought. Many experienced coursing people believe it just happens or it doesn't. Others believe that you can imprint chasing a lure on young puppies and they'll grow up enjoying it. My Poodles have very low prey drive by design. So I do need to engage them as young pups to "chase the bunny". and help them reach their physical potential, as well as to create a bond with you. were more interested and succeeded at Coursing right away, than dogs just introduced to it for the first time later in life. before seeming to reach the end of an invisible leash and then just returning to me. basically all things where there is no correction, before proceeding to formal obedience. We had the benefit of an experienced sight hound racer help guide us. She gave us a horse whip to attach a rabbit pelt to the end of it. We then run with the puppy chasing it and keep it just out of the pup's reach. We then let the puppy succeed at catching the pelt before they loose interest and we let them keep the pelt for a while praising when they carry it. We do this game of "chase" for only a few minutes 3x a week so they stay "keen" on the game. 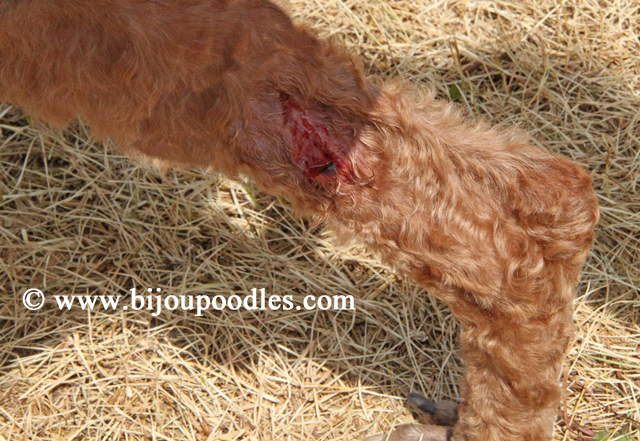 We never do sharp corners or circles as could cause injury to a young puppy. I also use a command "get it, get it, get it" just to excite the pups and let them know it is an OK game. We start our pups out on a "Straight run" just a down and back so they succeed without too much effort and gain confidence. but they are being praised for grabbing the lure and capturing it. Lure just out of the puppy's reach and to pop it for them. A new dog and a poodle, will not usually chase something that is 20 feet a head of them like a sighthound will. and understands that she is getting praised for capturing the lure. In this video you see me introducing the dog to the pelt and showing her that this is what she is going to "get"
The officials and myself had a bit of a discussion over placing the dog as I wanted her a head of the Lure but they wanted me behind. They were told she is a "new dog" and they agreed she could be infront of the Lure so that is what we did. This being said it would have been even better to have her infront of the pelt as well, but this worked. A word about injury potential from the Canadian Sighthound Field Association is in order. that strung tautly between the pulley system or by typical sporting injuries to muscles. and all of the Professional clubs have experienced and knowledgeable handlers who know what to do in case of an emergency. Often veterinarians and people trained in animal health are present and can handle just about anything that comes up. 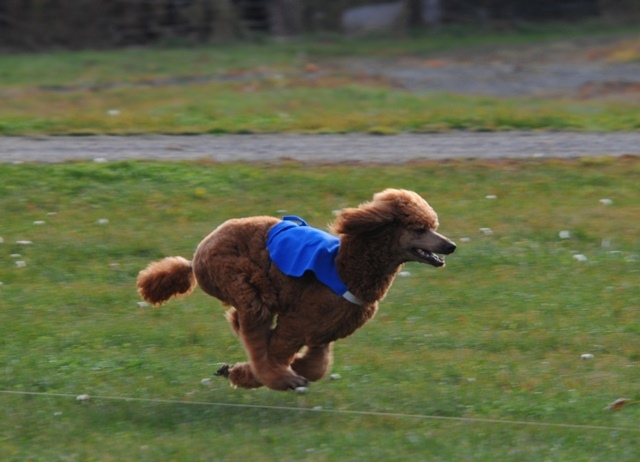 That being said Poodles, unlike more "driven" type breeds, tend to moderate themselves. 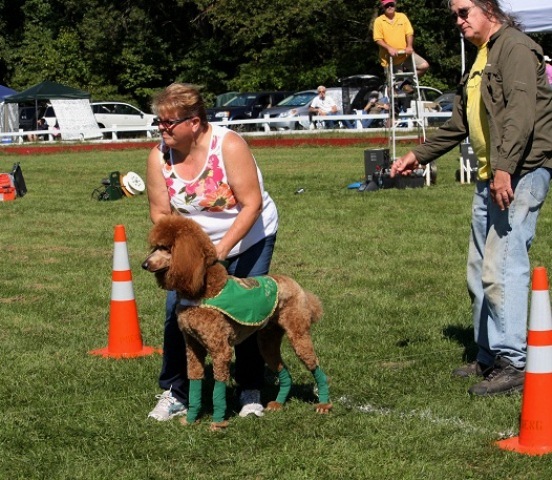 Poodles are thinkers and generally will avoid any injury to themselves. 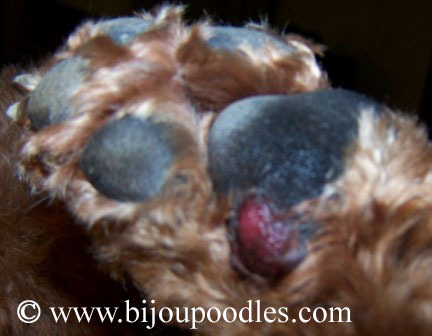 who will approve a course's design and equipment, to best ensure the safety of your dog. Some dogs will do it right away and other dogs need to go to a few practice matches to get the hang of it. Do not get discouraged, keep positive and keep bringing them out to watch other dogs and get excited with them. 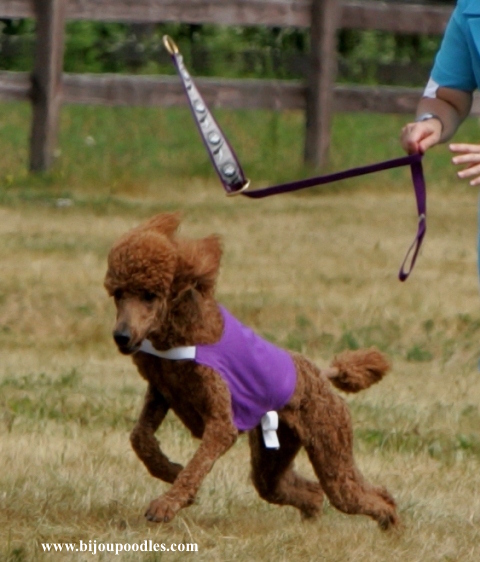 During a practice we may even run with the dog giving praise and encouragement. Eventually most dogs will do a complete course with enough experience, praise and encouragement. 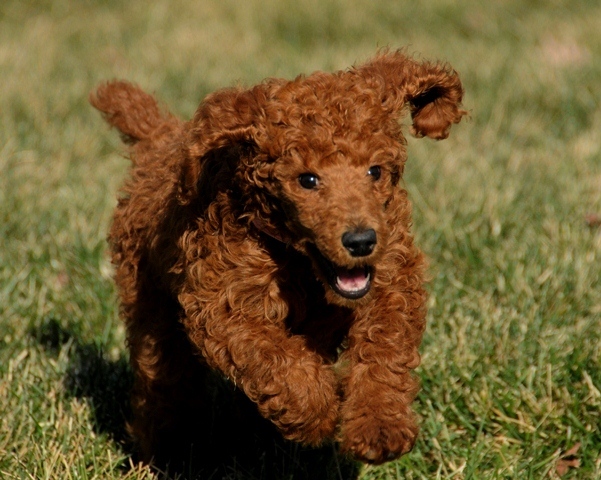 Will my Poodle want to chase all cats and small creatures after doing Lure ? 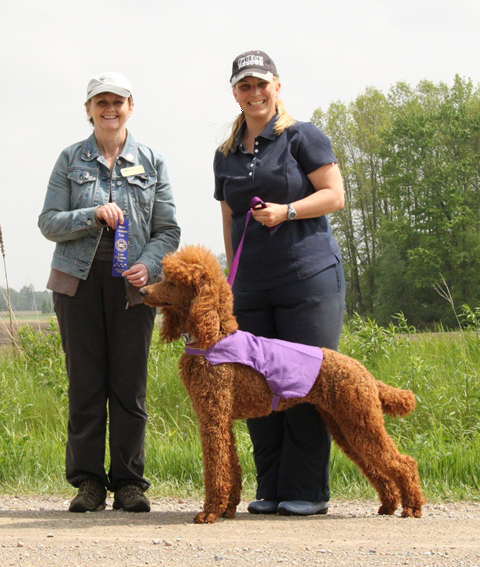 My most excitable Lure Coursing Poodle is also obedience trained. One day we were out front of my home getting out of the car and she saw a squirrel across the street and like any dog, she started to run to it. without any prey or killer instinct. If a dog has a high prey drive to begin with, then this sport will not make it any worse. and will probably be lacking a prey drive to chase and kill small game. Remember there is also big difference between "pelts" and living, breathing creatures. For Lure Coursing Aptitude Test you do not need any special equipment. You will need a leash that you can control your dog with and also easily and quickly release on the command "Tally Ho". However, you can also use the same equipment that the sight hound people use and that is listed below. which also has a leash built right in. 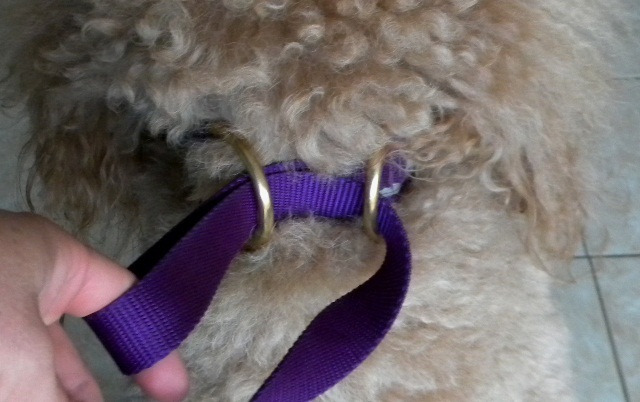 The Slip lead can have "rings" to weave the leash through or have a snap. 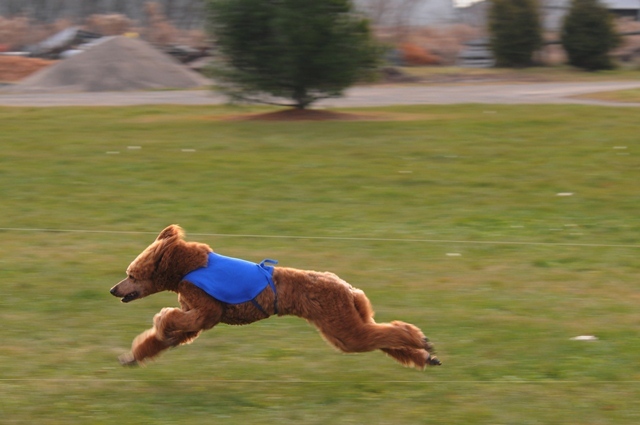 Either release mechanisms are designed to release the dog FAST and safely. Everyone has their preference. We use the rings model. 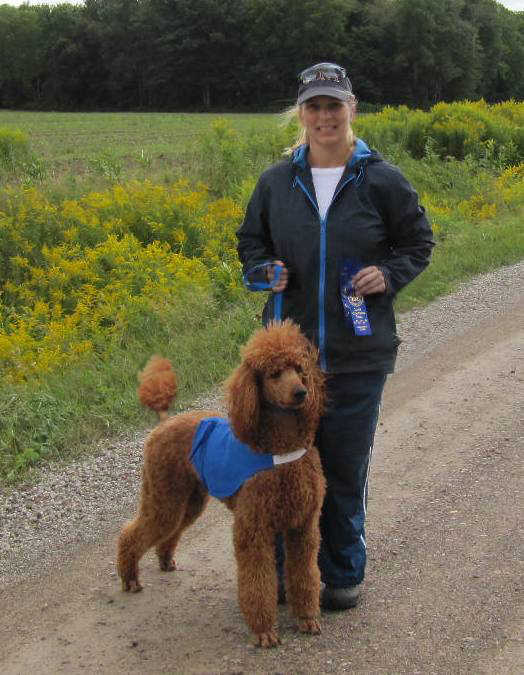 Sight hounds race together, so they wear different coloured "Blankets" to identify them at the finish line. Official Blanket colours are very bright and are coloured Yellow, Blue and Pink. 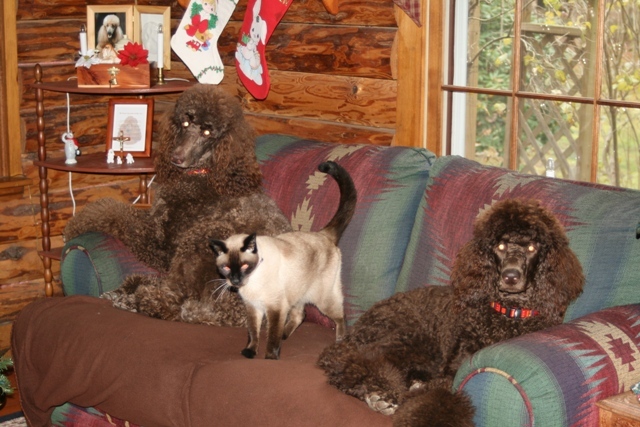 Poodles and All Breed Dogs, run by themselves and do not wear Coats. I checked out the rules and as of 2011 there is no rule about All breeds wearing coats. 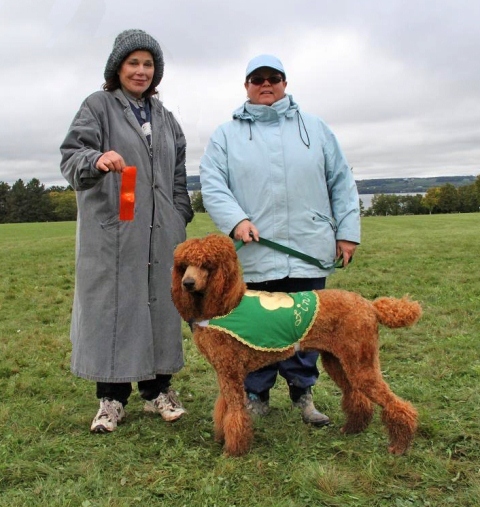 or Videos, Coats help people to know your dog is in an event and not just running across a field. Also because they are so fast, different colour coats help me to know "who is who" later when reviewing video. 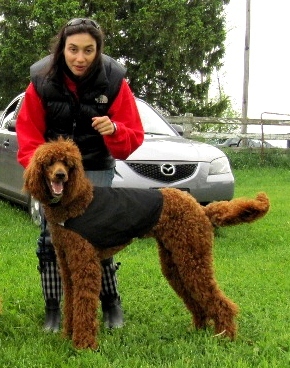 coats with jewels and embroidery, until this is not allowed, as just makes for more fun and Poodles like their "BLING". 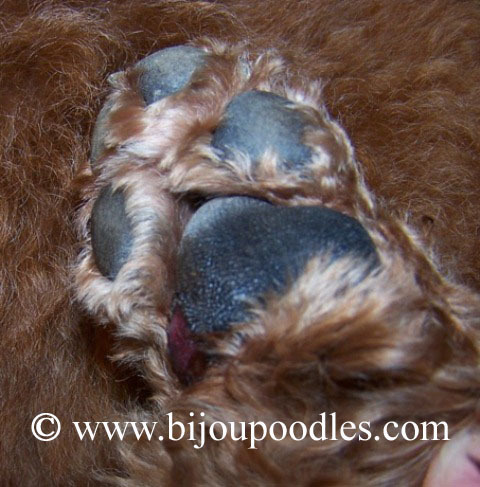 Protective leg wraps are allowed and at the owner's discretion. as some associations only allow beige or taupe. and to keep long coats from tripping up the dogs. Long haired breeds may use a rubber band or barrette to keep hair out of the dog's eyes. This classic lunge whip is constructed of Nylon with a rubber handle. comes apart for easy storage and travel. Gives you more reach and ability to send the lure out infront of your puppy for training. A. CA - Coursing Aptitude Title The Coursing Aptitude Titles are earned from the Coursing Aptitude Test. a. Earn three qualifying scores at three different UKC Licensed Coursing Meets in the Coursing Aptitude Test. b. A qualifying score is defined as; the dog shall run alone, and must complete the course with enthusiasm and without interruption. c. Three qualifying runs must be obtained under at least two different judges. 2. United Coursing Aptitude Excellent (CAX). title beginning at the next coursing meet following the completion of the requirements of the United Coursing Aptitude (CA) title. 1) Earn 12 qualifying legs earned by running alone. 2) There shall be no restriction on the number of judges. beginning at the next coursing meet following the completion of the requirements of the Coursing Aptitude Excellent (CAX) title. 1. Earn 15 qualifying legs by running alone. 2. There shall be no restriction on the number of judges. 3. The CAS title will have numeric designations to signify the number of times the title has been completed, for example CAS2, CAS3, etc. Three titles will be awarded for dogs that pass the Coursing Ability Test the required number of times. These are suffix titles that will appear on a dog's pedigree with a higher level title superseding a lower level title. Coursing Ability (CA) - Awarded to a dog that passes the Coursing Ability Test three times under at least two different judges. Coursing Ability Advanced (CAA) - Dog passes the Coursing Ability Test a total of ten times. Coursing Ability Excellent (CAX) - Dog passes the Coursing Ability Test a total of 25 times. Coursing Ability Excellent 2 (CAX2) - Dog passes the Coursing Ability Test a total of 50 times. AKC introduced the Coursing Ability Test, for all breeds, on February 24, 2011 in Calhoun, GA. The American Kennel club followed suit of the UKC and is using the same titles.